A study comparing the structure and function of human and mouse interleukins revealed a close link between protein folding and immune regulation. Interleukins are small, secreted proteins that drive immune cell communication. Understanding how cells produce interleukins is considered to be critical for decoding and modulating immune responses. An example of particular complexity and biological relevance is the interleukin 12 (IL-12) family. Four functionally distinct alpha-beta heterodimers are assembled from only five subunits to regulate immune cell function and development. In addition, some subunits act as independent signaling molecules. In particular, IL-27 is composed of two subunits, alpha and beta. In humans, these have to assemble to form bioactive IL-27, whereas in mice, IL-27alpha can be secreted alone, modulating immune reactions and reducing sepsis-related mortality. 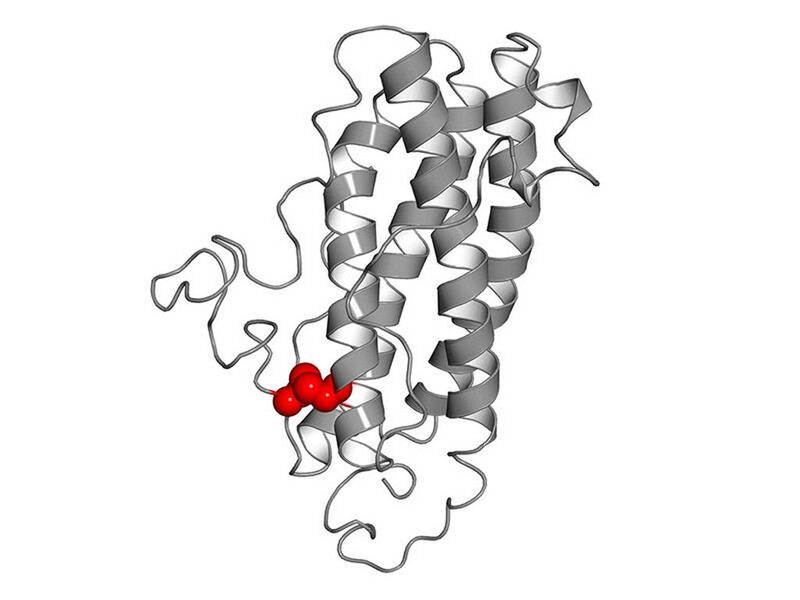 Image: Modified human interleukin-27-alpha. Inspired by the murine interleukin-27-alpha, one amino acid has been exchanged, enabling the formation of a disulfide-bridge (marked in red) (Photo courtesy of Dr. M. Feige, Technical University of Munich). Investigators at the Technical University of Munich (Germany) reported in the January 16, 2019, online edition of the journal Proceedings of the National Academy of Sciences of the United States of America that differences in a single amino acid determined if IL-27alpha could be secreted autonomously, acting as a signaling molecule, or if it depended on hetero-dimerization for secretion. By combining computer simulations with biochemical experiments, the investigators dissected the underlying structural determinants: a protein folding switch coupled to disulfide bond formation regulated chaperone-mediated retention versus secretion. 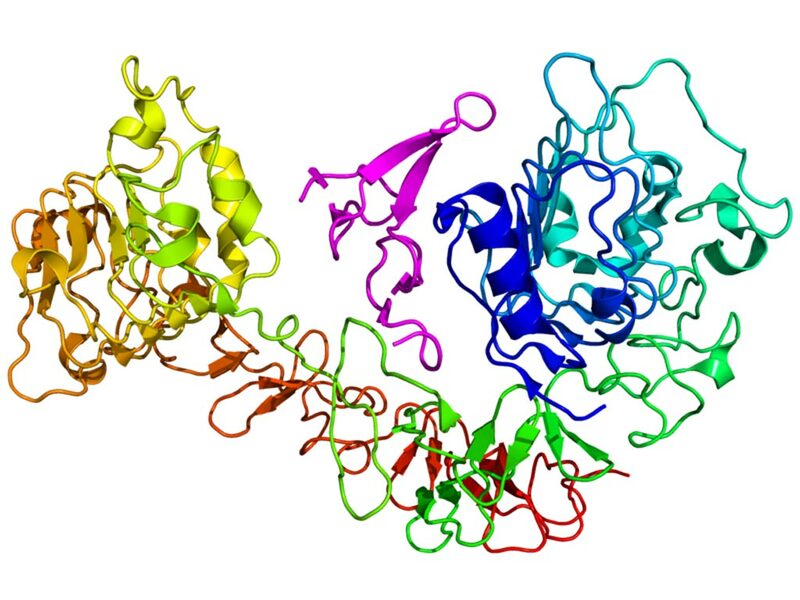 Using these insights the investigators changed folding and assembly control for this protein. This provided the basis for a more human-like IL-27 system in mice and established a secretion-competent human IL-27alpha that signaled on its own and could regulate immune cell function. "The interleukins are the vocabulary with which immune cells communicate," explained Dr. Matthias Feige, professor of cellular protein biochemistry at the Technical University of Munich. "The cells form these messenger molecules according to a very specific blueprint of individual amino acids. Their arrangement determines, which three-dimensional structure an interleukin adopts and, consequently, which information it transmits. Our approach allowed us to rationally extend the language of immune cells by engineering a key signaling molecule. This provides us with an opportunity to modulate the reaction of immune cells in a targeted manner."